Discovering new places to eat doesn’t necessary mean going only to the latest new restaurant in the city. Restaurant that have been open for a long time in Montreal usually share a common trait, consistency in their recipe and food quality. I was happy to go try the menu at Cafe International as it’s been established in Montreal in 1968. Since its inception, the café has maintained a warm and authentic ambiance for its patrons and commits to a true Italian restaurant ambiance right in the heart of Montreal’s Little Italy located on the corner of St-Laurent and St-Zotique. This is not the type of restaurant where you’ll go to be seen or because they’ve spent a fortune on the decor, but what they lack in decor they make up for with their food. Don’t get me wrong the place is very nice and they have a great terrasse, but it doesn’t look like some of the trendier places you’ll see downtown. Now let’s talk food! I started my tasting with the Bruschetta, the mix of tomatoes, basil, red onions and olive oil surprised me with it’s freshness. Tasting every ingredients and the balance they brought to each other was an experience. Ok so you can get by now that food was pretty good when I’m getting exited about Bruschetta! The next dish was grilled calamari, served with tomatoes on salad. This was a very light and fresh mixture that followed nicely. To move on to more filling dishes I tried the fresh tomatoes, prosciutto and Parmesan pizza. I like that the dough was warn but the ingredients were placed on it after keeping fully the taste of each ingredients while pairing with each other. The presentation of the lamb sausage was also cool, served with rapini, grilled red peppers and salsa Verde with a hint of mint it was twisted up and kept together with a skewer. The salsa did bring up the taste of the lamb and it was delicious. By this time I was ready to explode but who can turn down house made pasta. Trying to keep it under control I had the egg noodle pasta with tomatoes, oyster mushrooms, ricotta and pancetta. They serve the cheese on top as the chef was telling me that some people don’t like the cheese mixed up with the pasta but I mixed it up and it was just excellent. I thought I was done with my espresso but naturally they had to give me some house made biscotti as I refused to have desert. I love Italian food (as you can probably tell) and I can understand why this establishment has been a landmark in Montreal’s Little Italy district for years. If you’re a fan of Italian food like I am, try it out and give me your feedback! Since my last visit I also went to try their Breakfast. I went on a Saturday morning and it was not busy which is hard to find in the city. As for the breakfast, same as the rest of their food. Fresh ingredients and fruits that are actually eatable and not just for decoration on the plate. 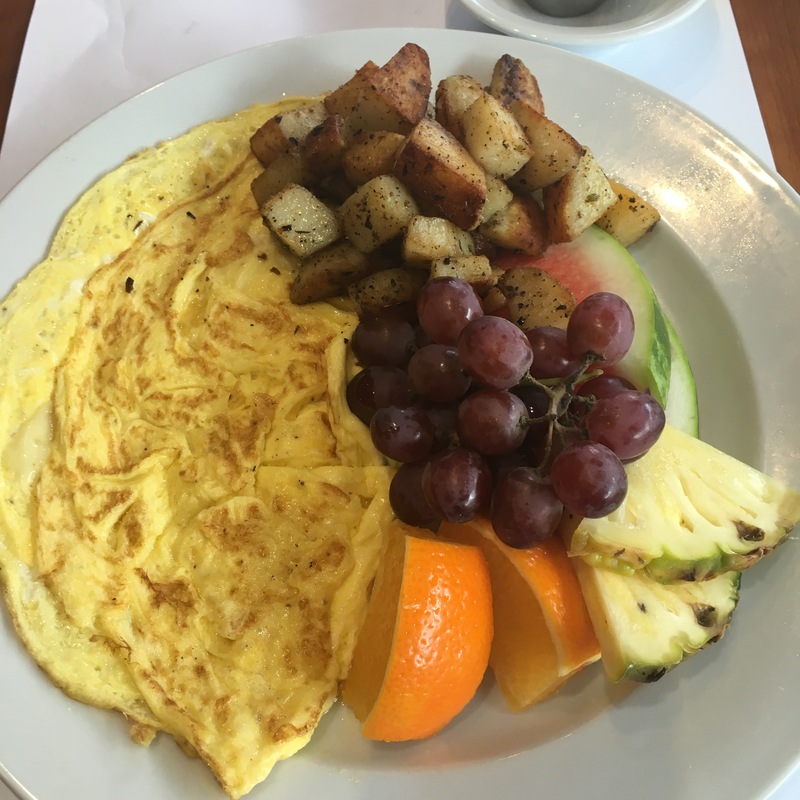 I had the cheese omelette and it can sometimes leave you feeling too full but the choice of cheese and the omelette it self were light but still filling.